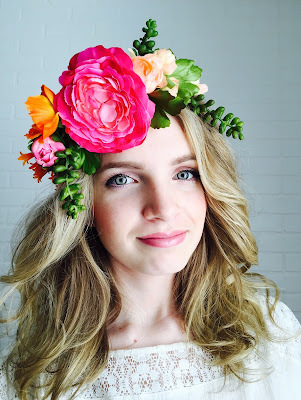 I have a serious crush on floral halos! The thing that is so awesome about floral halos, is they add such a feminine touch to every photo, and seem casual, yet formal. You can customize them to any color preference, and bring a little whimsy, and an unexpected pop! When you are wearing a floral halo, it is all about the persons face, and the flowers, not so much about the outfit, so try to stick to neutrals, and even white, is so beautiful with a halo. This is my screen saver on my phone. Perfection! My preference for a more casual photo, is to only have flowers on one half the halo. Put the crown of your hair in a clip, while you put the halo in place, and then let your hair fall over the back of the halo, covering the wire. I prefer fuller hair with this look as well, and this placement technique helps you achieve that, because it doesn't squish the hair down. Each Halo needs flowers of varying size and texture. I like using around three different colors. 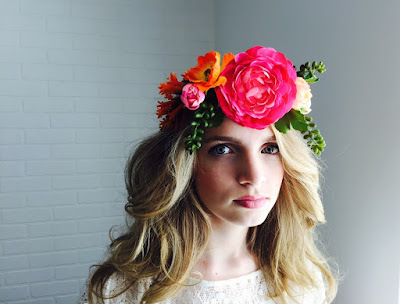 I prefer wearing the halo to the side, or it tends to look like a headlight, especially if your main flower is large. To make a floral halo you need wire. I prefer bendy from dollar store, because it is so moldable when you put it on your head. Flowers - spend a little more on these, if you are doing this for photographs. If you are just doing a craft day, dollar store is fine. Cut the flowers from the bunch, leaving a long enough stem to wrap with floral tape. Lay the stems on the wire, and wrap with tape to keep them in place. I like having a bigger flower in the middle, and tapering to smaller on the sides. The main flower on this arrangement ended up being a little larger than the look I was hoping for. I whipped another one together (photos at the top of the post), and by trial and error, figured out that its best to have flowers that are a little more flat, unless you are photographing mainly from the front. A little tip: For the purple flower halo, I left the stems long, and wrapped them in floral tape. For the colorful halo at the top of the post, I cut the stems shorter, and left the wire exposed. I even left it cut open in the back, so that it could be sized to different head sizes. We have large heads in our family, haha. I liked the exposed wire better because it was less heavy and bulky. It was easier to bend and mold to the head, and hid so well under her hair. These would make the perfect craft night for girlfriends and teens! My daughter LOVED being photographed in this, and she felt so pretty, cause she looked so pretty. So, if you are looking for a fun photo prop, or a craft night activity for teen girls, floral halos are an excellent option! I'll be sharing these and more beautiful flower ideas on Studio 5 on Friday, along with a few additional tips and tricks, so be sure and watch! I love these. I can wait to make some.